Tours from San Francisco to Sonoma County for wine, craft beer, and cannabis. 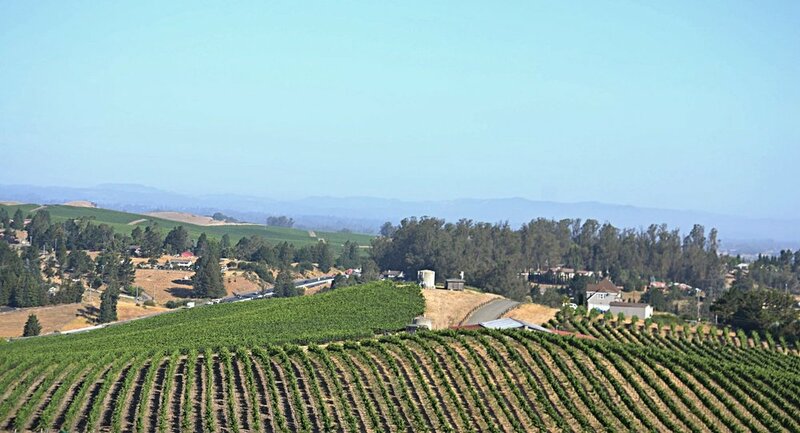 Our estate vineyard lies on 144 acres in the rolling hills that separate Petaluma and Cotati. We have 35 acres planted to Pinot Noir and Chardonnay in the Petaluma Gap sub-region of the Sonoma Coast. The site is one of the best places in the area to understand the Petaluma Gap: facing west, on a clear day, one can see 20 miles out to the marine layer blanketing Bodega Bay. This vista is afforded by a gap in the coastal mountain ranges that parallel the shore along Marin and Sonoma Counties. This same gap funnels cool, moist air in from the Pacific Ocean along the low-lying areas to the San Pablo Bay. The fog limits the amount of sunlight, which delays sugar accumulation and helps retain natural acidity. When the afternoon winds pick up, the vines begin to close their stomata on the undersides of leaves, essentially shutting down transpiration (also limiting sugar accumulation) until the wind speed slows down. These conditions allow us to harvest the grapes with mature flavors and aromas at lower sugar levels.